No one seemed excited when we told them we were going to Philly for the weekend, in fact, we got a few whys, and a sarcastic have fun. But all those naysayers are missing out on the reemergence of America's birthplace as an exciting destination with world-class art, a red hot food scene, and historical sights that remind us, in these stressful political times the essence of who we are as Americans and the lofty aspirations of our founding fathers. Three days was hardly enough time to see and do everything, and we can’t wait to return, this time in warmer weather! Art Meca: Rocky made the Philadelphia Museum of Art’s steps famous, but this is one of the most visited museums in the world thanks to an impressive collection of European, American and Asian art. And things are going to get even better by 2020 with the help of world-renowned architect Frank Gehry who is redesigning the interior, expect more public spaces and more room for the art itself. And yes, be sure to go outside and take in Rocky’s Steps for awesome views of the city of Philadelphia from the east entrance of the building. Hip Neighborhood: Locals told us that years ago no one ventured into Fishtown, but that has certainly changed. Frankford Ave is now a trendy street with boutiques, restaurants, and cafes. We had lunch at Cheu Fishtown where you must order the brisket ramen with matzoth ball and kimchi in a red chili broth. Whoever thought of this combination-- we thank you. One brunch we had a fantastic array of Lebanese mezes and flatbreads in the beautiful sprawling space of Suraya. With a large back garden and a front of house all-day market and café, if we lived here, we’d be regulars. (The dinner menu looked equally appealing and is a difficult reservation to secure) Allow time for a coffee after at La Colombe’s flagship, a vast industrial space of high design with not just coffee but also a food menu, it’s a must see! Other Fishtown restaurants that have the town buzzing include Frankford Hall, Wm. Mulherin’s Sons, Kensington Quarters and Stock. More Eats: Good luck getting a reservation at Zahav, Philly's acclaimed Israeli restaurant from Chef Michael Solomonov, we have never had any success, even trying weeks in advance. We did pat ourselves on the back for securing at a table at Vernick Food and Drink and our meal was a home run –start with one of the toasts and go crazy from there. We dined another night very happily at Friday, Saturday, Sunday—a small intimate restaurant near Rittenhouse Square serving inventive new American cuisine washed down with excellent craft cocktails. Other top tables on our to go list include Abe Fisher, Vetri Cucina, Vedge, High Street on Market, Sampan, and Palizzi Social Club. Old City: If you haven't visited the Liberty Bell and Independence Hall since your kids' school trip to Philly, it may be time for a repeat visit, but if you’re short on time we’d suggest the nearby National Constitution Center. 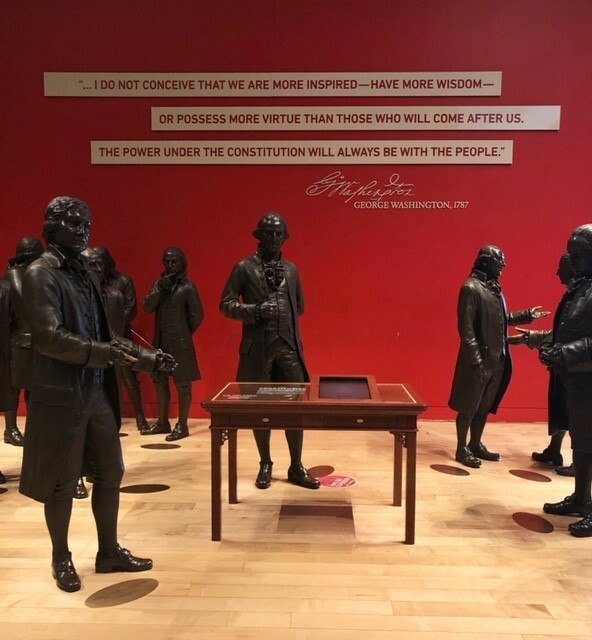 It’s an engaging, informative and surprisingly stirring museum devoted to the U.S. Constitution. Kids will love it as there are tons of interactive exhibits, but we admit we teared up at the 20-minute show called Freedom Rising. A perfect one-two punch, you can walk over after to the year-old Museum of the American Revolution for a full history immersion. Other landmarks in the old city include Elfreth’s Alley one of America’s prettiest streets with homes built in the 18th century and The Betsy Ross House. Quirky Attraction: The Mutter Museum whose tagline is “disturbingly informative” is not your ordinary museum, located inside the headquarters of the College of Physicians of Philadelphia. It’s not for the faint of heart showcasing medical oddities, and after looking at all the diseased lungs and kidneys, you might want to embark on a juice fast after your visit. With everything from the remains of Einstein’s brain, conjoined twin skeletons, shocking wax models showing the effects of syphilis and preserved human fetuses it’s no surprise children are discouraged from visiting. Fascinating! See This: Another unique attraction, Philadelphia’s Magic Gardens is a walk on the wild side, an indoor and outdoor space from local mosaic artist Isaiah Zagar. It’s a surreal, dreamlike experience that’s spread across three city lots-- a mash-up of colorful tiles, glass bottles, and objects reminiscent of Gaudi’s works and Fusterlandia in Havana. You don’t need much time; I'd set aside an hour and a bit especially if you want to watch the interesting short film that interviews Zagar playing on a loop. Mangia: Don’t miss wandering around South Philadelphia’s Italian Market where vegetable vendors, butcher shops, fresh seafood and Italian goodies of all kinds can be found in this legendary district, a cross between the Bronx’s Arthur Avenue and NYC’s Little Italy. The neighborhood market stretches down some ten city blocks on Ninth Street. Don’t miss Philly’s beloved Di Bruno Bros. where locals come to stock up on meat and cheeses. In the last few years the area has seen an influx of Mexican and Vietnamese run businesses and none more famous than South Philly Barboca, considered to have some of the best slow cooked lamb tacos in the country. There's bound to be a line, but it moves fast, and yes we waited, and yes it was well worth the wait. Note: it’s only open on Saturdays, Sundays and Mondays so plan accordingly. Public Art: Philadelphia has been called the city of murals thanks to the city’s Mural Arts Program, one of the US’s largest urban arts programs. Be on the lookout, and you’ll see many murals in your travels throughout the city, but if you want to delve further there are walking, trolley and train tours plus maps for self-guided experiences. High on our list is the Love Letters Train tour, read all about it here. 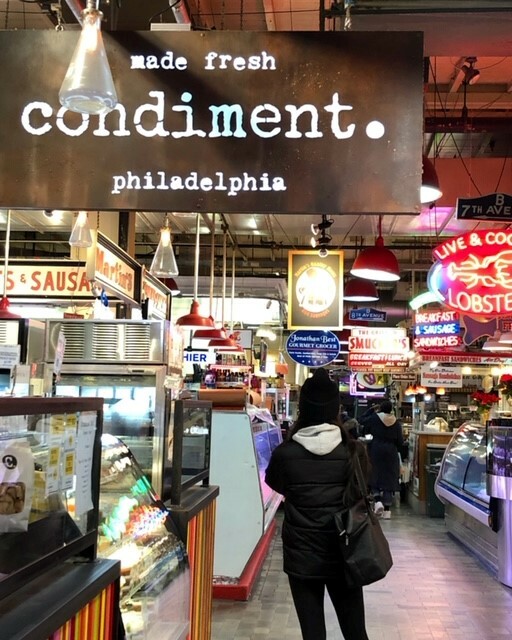 Foodie Nirvana: The Reading Terminal Market is a city landmark and a must-see, even if you don’t go for a meal, go for a morning stroll and a cup of Old City Coffee or an afternoon snack. A large, bustling old school food hall that dates back to 1893 it’s filled with neon lights and a maze of some 70+ food vendors, plus flower stalls, kitchenware, cookbooks, even jewelry and craft merchants—a visual feast! Try some apple dumplings at Dutch Eating Place, roast pork sandwiches at DiNic's, fried oysters at Pearl’s, pretzels at Miller’s Twist, salmon curry at Little Thai Market or ice cream at legendary Bassett's Ice Cream just to name a few local favorites, but expect crowds--the market attracts more than 6 million visitors a year—only the Liberty Bell has more tourists! Until Next Time: We ran out of time and were bummed to miss the Barnes Foundation to see Dr. Albert C. Barnes’s once private collection of Impressionist, Post-Impressionist and early modern paintings. We had also hoped to squeeze in a visit to the Rodin Museum and the American Museum of American Jewish History. The Line DC is the second Line hotel from the Sydell Group whose mission is bringing food and community together, and from our weekend stay, we’d say its already on its way to becoming a neighborhood fixture. Elegant architecture, old world charm and artsy new neighborhoods like Mile End and Petite-Patrie make crossing the border even more appealing. Grab your passport and tag along with us as we explore Montreal. This year, unlike previous visits where we rented a house, we checked into the lauded and highly touted, The Wauwinet, located on the northeast shores of the island. Let us just say we wouldn’t check in again on future trips. From a fabulous tour guide to our favorite music joints here’s Daytripper's guide to the city often referred to as The Big Easy. Chicago's best things to do! Narrowing down where to eat on a recent trip to Chicago wasn’t easy. Did we want to revisit old favorites such as Blackbird, Naha or The Publican? Dine at high-end legend Alinea or their brand new, much praised, more casual Roister. Did we spend hours trolling the Internet, grilling the hotel concierge and asking local friends –yes, yes and yes. Can we save you time with our go to list—again-yes, yes and yes. Happy eating! Side Note: Chicago is a city of neighborhoods and you could very easily dine well without leaving a zip code. Taxi’s and Ubers are plentiful, and you can also hop on the “L,” Chicago’s elevated train line. Wicker Park: Right in the heart of hip Wicker Park, are our new favorite next door neighbors --Dove’s Luncheonette, and Big Star Tacos. Dove’s is perfect for a solo meal or a cozy couples date, with counter service (just 41 stool seats) Dove’s doesn’t work for a group. 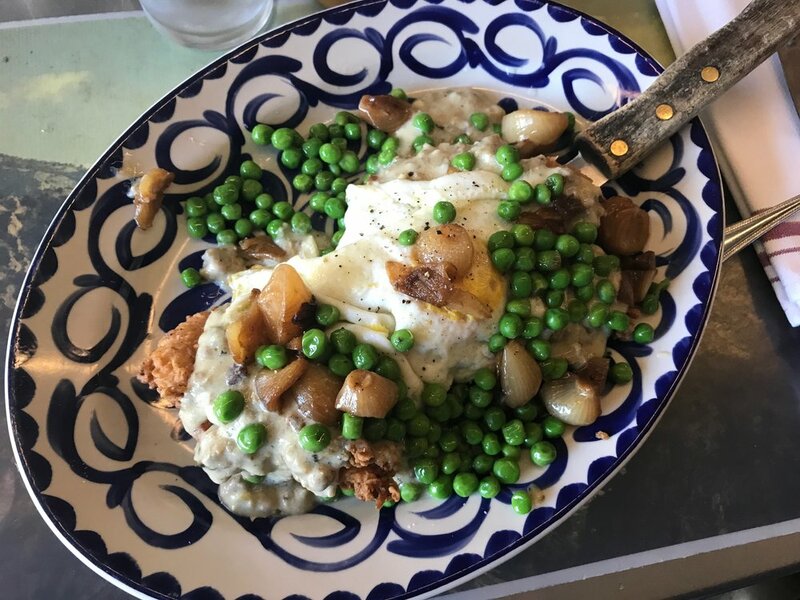 A Tex-Mex diner with retro throwback chic, our lunch of chicken fried chicken with chorizo gravy with sweet peas, (a signature dish) was worth the Uber. With over 70 agaves and tequilas to choose from, we’d love to return for a casual dinner date. It’s always a party at next-door’s Big Star, especially on a warm day or evening when the patio is packed with groups enjoying tacos and pitchers of margaritas, beers or bourbon. After lunch, we spied someone walking by with a soft serve that looked so good we just had to ask. Right across the street at noodle heaven, Urban Belly, you must get (you don’t need to be hungry) a soft serve vanilla ice cream topped with peanut butter and jelly. Trust us. West Loop: You could easily eat all your meals in the red hot west loop ‘triangle’ with everything on or branching off Randolph Street, a mini restaurant row. The reigning star of the West Loop, Stephanie Izard’s Girl and the Goat has not lost any steam since it opened some eight years or so ago --still an impossible reservation to come by. No luck getting a table, go and sit at the bar, and sample from the eclectic menu. The Goat empire continues across the street at Little Goat, good for breakfast and lunch—a diner with a chef’s creative twist. We loved the inventive Chinese fare at Duck, Duck, Goat washed down with killer cocktails. The space at Avec is cool and minimal, the service is professional and friendly and the food is delicious, with many vegetarian options. Do not miss the chorizo-stuffed bacon-wrapped dates. There’s a reason you see it at every table. We wanted to love Bad Hunter, it’s a big, lively space with an interesting veggie-centric menu, but the food was good, not great. Press has been very enthusiastic, so perhaps we hit an off night. The Loop: After a mandatory stop at Cloud Gate in Millennium Park, or a visit to The Art Institute, go high at The Chicago Athletic Association. Reborn as a hotel, the 1920’s Venetian Gothic building, an architectural gem offers tours in conjunction with the Chicago Architecture Foundation. Cindy’s, the rooftop restaurant at the Athletic Association has stunning panoramic views overlooking Millennium Park and Lake Michigan. The seasonal American plates compliment the view, quieter at lunch; things heat up at 5 when everyone arrives for cocktails around the fire pit or in the glass and steel atrium. River North: Rick Bayless may be the most famous chef for Mexican fare this side of the border and his three restaurants in River North are favorite Chicago destinations. 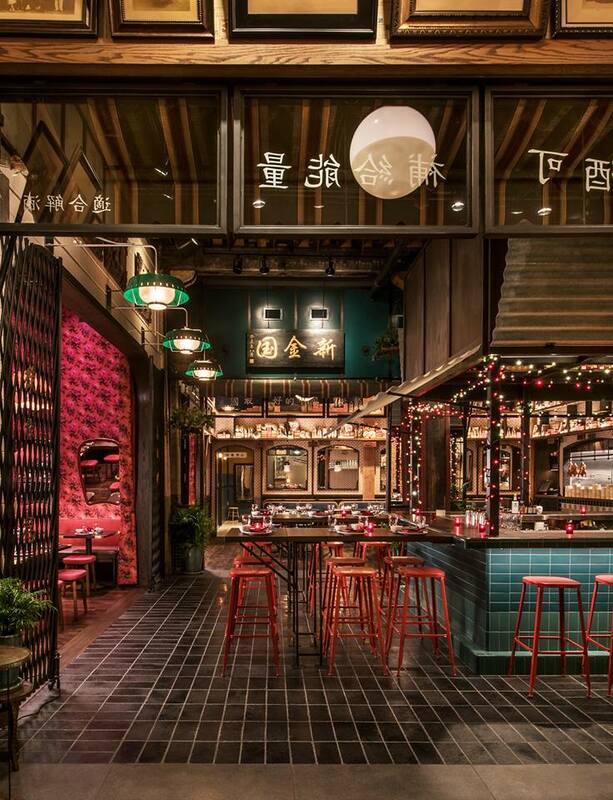 Fat Rice can be credited for bringing Macau cuisine into the spotlight. (a fusion of Chinese-Portuguese influences) Though everything on the menu sounds great, the namesake dish of Arroz Gordo (fat rice) is the draw, resembling paella on steroids. Perfect for a quick weekend away, Portland is Maine’s biggest city attracting attention in the last few years for an emerging arts, music and food scene. We’re just back from LA where in addition to stops at The Broad and the beach we ate, ate and then ate some more. LA is one of our favorite eating cities; restaurants are laid-back and creative, showcasing seasonal and local fare thanks to produce that is off the charts. LA reflects the rich cultural diversity of America, in the mood for Thai, Korean, Mexican, or Chinese—no problem! Like many food obsessed cities there’s always something new opening, but here’s a list to get you going with some of our favorites. As an added bonus, we asked our friend and local foodie guru Alison Dinerstein of Twist Your Spirits to share her favorite haunts listed below. 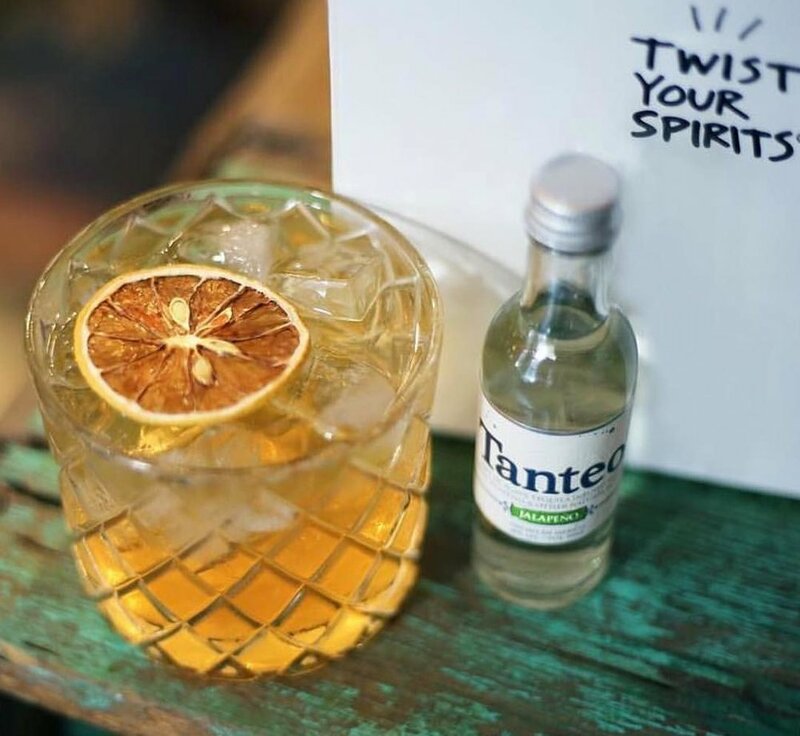 Check out Twist Your Spirits artisan cocktail kits and be your own mixologist at home—just add your favorite spirit and some friends and you’ve got a party! Bowl Food Nirvana: Breakfast at uber popular Sqirl is worth waking up for -- it’s best to go early, anyway, to avoid a long line, and be warned—you’ll want to order everything on the menu. On a non-descript street in Silver Lake, the space may be minimal but there’s nothing simple about the flavors of the food. Sure you’ll see the sorrel pesto rice bowl on everyone’s table, but we’re still dreaming of the chicken and rice porridge, and addictive, crispy rice salad. It was so good we ordered the cookbook as soon as we got home so we can recreate it all summer long. Oh and you need to get the ricotta toast with homemade jam, it may be an over order, but who cares you can skip lunch. Better at Breakfast: Don’t get us wrong we love Republique at dinner, but with reservations hard to come by, breakfast works just fine for us. Order at the counter and grab a seat at one of the large communal tables where folks are digging in to shakshuka, mushroom toast, kimchi-fried rice or one of the excellent pastries. And can we talk about the bread--we would be happy with just a baguette and the Normandy butter, the best bread and butter anywhere. Republique is striking, especially during the day with the light streaming in. Italian Corner: Over on Highland and Melrose, there’s an Italian trifecta from Chefs Nancy Silverton and Mario Batali—casual Pizzeria Mozza, meat centric Chi Spacca and fine dining Osteria Mozza. We ate at Osteria Mozza known for its mozzarella bar, flavorful salads and great pastas. (Order the orecchiette with sausage) Don’t skip desert here-- Dahlia Narvaez won Outstanding Pastry Chef at the 2016 James Beard Awards—one bite of the huckleberry bombolini and you’ll know why. Spicy: Night and Market is fun for addictive chicken wings and papaya salad unless you’re spice sensitive-- the thai food here is hot, as in spicy hot. (There’s also sibling Night and Market Song in Silver Lake) Jitaldia may be in a strip mall, but this southern-thai spot with an extensive menu is the real deal. Jitaldia doesn’t take reservations so go early or at lunchtime, if you don’t want to wait. Downtown Smorgasbord: It was love at first sight for us at the historic Grand Central Market, a massive food hall and serious eating destination with overwhelmingly good choices. The only problem is deciding what to eat, from breakfast sandwiches at Eggslut, burgers at Bel Campo, falafel at Madcapra, smoked fish at Wexlers Deli, that street food at Sticky Rice or tacos at Tacos Tumbras A Tomas. Brand new from the owners of Republique, Sari, Sari Store is one to watch for Filipino comfort food—we expect his will be a new go-to in the market. Finish it all off with an excellent coffee at G & B Coffee. Scenic: The waves are the soundtrack at stunner Nobu in Malibu where you could say the food, though excellent, is the supporting actor to the ocean setting. Go for lunch, sit on the patio and don’t forget your sunglasses. After lunch go for walk on the scenic Malibu Pier and watch the surfers. Malibu Farms, is a great healthy spot for salads and sandwiches on the pier, read more about it here. Inventive: In a hip space in Koreatown, Heres Looking at You serves creative small plates made for sharing alongside delicious cocktails—take an uber and don’t drive. The Hamachi Collar with fuji apple, snake beans and Nashville Hot sauce demands a return visit on our next trip. Local: Rose Café is the kind of place you wish you had in your neighborhood—it’s great at any time of the day—with friends, with kids, a date or even solo. This iconic Venice restaurant has been completely redone into a multi-concept eating venue. The large, eclectic space boasts a bakery, coffee bar, bar area, big open kitchens, plus two patio’s. The food is good, it wasn’t our best meal in LA, but we loved the space and the vibe, all in all a fun night. Just Opened: From Josh Loeb and Zoe Nathan of Huckleberry, Rustic Canyon, Cassia and Milo and Otis fame its no wonder Tallula’s, though new to the scene, is already packing in the crowds in Santa Monica. The menu reads Mexican modern with SoCal influences served up in a fun, beachy space. Leave room for Nathan’s desserts and definitely have one, or more, of the delicious cocktails. Ethnic: Out scouting USC for Daytripper University we had lunch at Chichen Itza in the nearby Mercado la Paloma. There’s a reason locals rave about the pork and chicken pibil--its the kind of plate where everything speaks to each other in each bite—sweet plantains, black beans and oh so flavorful meat. The owners have just opened Holbox in the same market featuring raw and cooked Yucatan-style seafood, now there’s even more reason to go to the Mercado hungry. Anytime of Day: From the first moment we walked into Gjusta we were smitten—the chic industrial space, the beautiful food displayed behind glass cases, the bakers at work. Gjusta is the younger sibling of one of our favorite restaurants in LA--and really anywhere else too—Gjelina. (Book well in advance for Gjelina) If we lived in LA you’d find us here a few times a week eating on the back patio or grabbing take out to bring home or to the beach. The breakfast Bialy sandwich is seriously addictive; loaded with egg, merguez sausage, arugula, gruyere and harissa--so good were still thinking of it while eating our grain free granola back home. 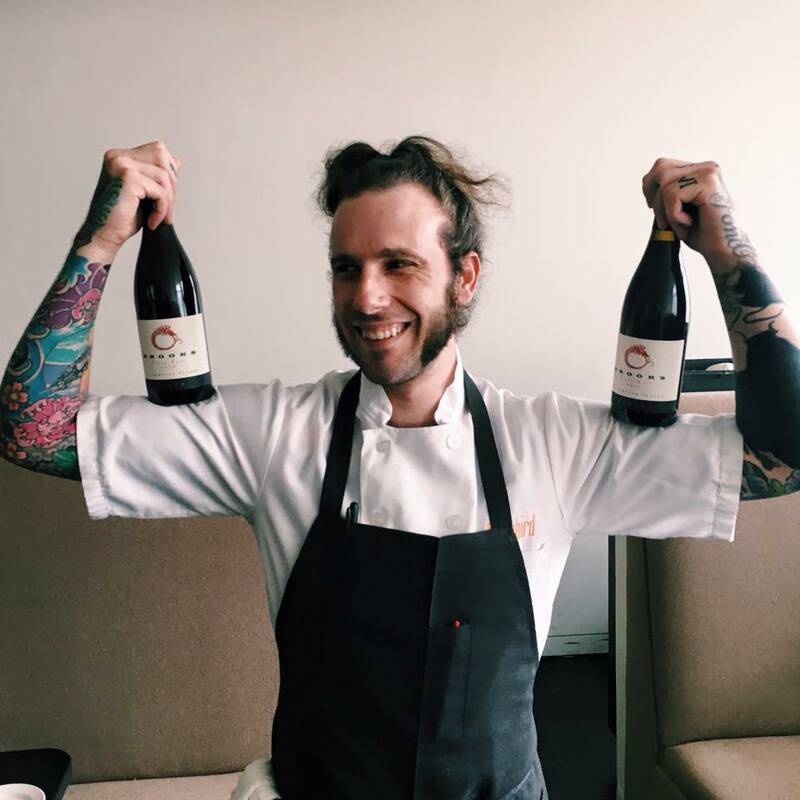 Pasta Master: Chef Evan Funke is back in action with hand rolled pastas at Felix in a Venice bungalow on Abbot Kinney. The centerpiece of this buzzing Italian is the climate controlled room where pastas are being made in front of you—this is cacio pepe heaven! 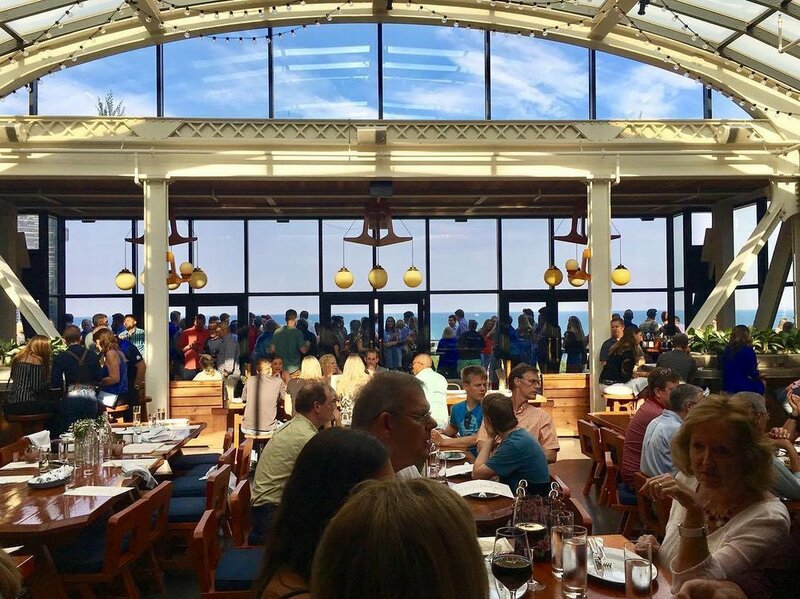 Fish, Fish, Fish: Connie and Ted’s is loud and bustling—with a New England menu of lobster rolls, clam chowder, grilled fish with herbs and a seafood boil that is summer in a bowl. It’s a fun, casual place for good reliable seafood and perfect for larger groups. Dig in to the Parker Rolls and order the calamari to start—trust me. Word of Mouth: Everyone’s talking about Kismet, and for good reason. This all day, packed, minimalist spot in Los Feliz showcases a veggie heavy, Middle Eastern menu, from the team behind Madcapra. We don’t know about you but we are over avocado toast and the delicious broccoli toast is a welcome spin. You need to order the Persian cucumbers with lebneh and parsley seed za'atar-and the shakshuka-and the flaky bread. Better yet, go with a friend or two so you can share. Salads: Joan’s on Third is great for breakfast and lunch with a side of good people watching. This is the space that I’m convinced Nancy Myers used as her inspiration for Meryl Streep’s gourmet kitchen shop in the movie ‘It’s complicated’. Come here for a quick bite—there’s an array of good sandwiches, veggie plates and salads. On a nice day sit outside before heading over to Melrose to shop. Good Luck: Book way in advance at Bestia, located downtown in the hot arts district. The food is rustic Italian, the space is industrial, and the place is perennially packed-one of the hardest reservations in LA to get. Ran Out of Time: We so wanted to try the bowls we’ve been seeing on Instagram at Baroo. And tacos at Guisados, Oaxacan food at Guelaguetza, and French-Asian fare at Cassia. We didn't have time to visit old favorites like Suzanne Goin’s Lucques or AOC, Italian classic Giorgio Baldi, or Spago in Beverly Hills. And, of course all the restaurants on Alison’s list below. West Hollywood/Hollywood: Papilles, Petit Trois, Nora, Jon and Vinnys, Gwen and Salt’s Cure, for brunch. Roadtrip: Cross-country from L.A. to N.Y. Whether you live in the U.S. or are visiting from another country, Washington D.C. is a must see. Boasting some of the best restaurants, boutique hotels, monuments, and museums in America, you could easily spend months exploring and never see (or eat!) the same thing twice. We are firm believers of the somewhat clichéd statement that it’s all about the journey and not the destination, and that road trips, more than most other trips, make the destination almost secondary. Time on the road promises spontaneous discoveries, wide-open landscapes, time to think, perhaps catch up with a friend or yourself, all the while listening to great music, podcasts or books on tape. We were thrilled when Sophie Barnett agreed to chronicle her recent cross-country jaunt from LA back to NY for Daytripper365. Follow along, we had a smile on our face the whole time, and so will you. Sophie reminds us that mishaps sometimes occur when you travel, but with a sense of humor and a good spirit it still makes for a fun trip nonetheless. For great book recommendations, on the road or on the couch, follow Sophie on her blog, Covers to Covers. Make sure you bring a good camera - we recommend Fuji XT2 or the Sony both mirrorless cameras. If you're looking for an instant camera, Fuji Mini 9 lets you take great photos. You can't go on the road without the right apps! iExit lets you see what restaurants, hotels and restrooms are off every exit on your road trip. Yes, we know you already know about Waze, but we have to reiterate how great this community based app is! This is the absolute best tool to help beat traffic and save you time. Gasbuddy is super helpful on the road. This price-comparison app helps users find the cheapest gas options on the road. If you want to try and match a book to the state you're visiting, Business Insider rounded up the most famous book set in every state across the country - read their article here. My boyfriend, Jamie, runs a pants company called Pkok. This spring, he’s been traveling to different colleges across the country and throwing events in conjunction with fraternities at which he sells the pants. I met him in Los Angeles after the USC event, and after a few days relaxing in Venice, we headed East on a road trip. Our destination: Washington and Lee in Lexington Virginia for another Pkok event later in the week. We had a lot of ground to cover! On day one of our road trip, we set out from The Rose Hotel in Venice around 11:00 a.m. Sustained by a brioche breakfast sandwich from The Rose Café (previously mentioned on Daytripper here), which just so happened to be one of the best things I ate during my entire stay in L.A., we steeled ourselves for the longest leg of our trip. Our plan was to drive to Santa Fe, which would take about twelve hours. While in L.A., we barely left the Venice/Santa Monica area, so I was pleased to discover that our route took us past downtown L.A. It was our final view of a sprawling metropolis for at least another three days. Our Tuesday drive spanned California, Arizona, and New Mexico. While the California landscape we traversed was essentially all deserts, it was Arizona, which surprised us the most. Considering Arizona generally conjures images of cacti, we were both surprised to encounter densely wooded area on our way to Flagstaff. For a good hour, we were also greeted with a view of a snow-capped mountain range, which a quick Google search revealed as Humphrey’s Peak, the highest natural point in the state of Arizona. Soundtrack: Along with a lot of heavy rap to keep Jamie awake, we listened to “The Subtle Art of Not Giving a F*ck” by Mark Manson. While Manson’s book was nothing revelatory; you’ve heard it before from the likes of Tim Ferris, Tony Robbins, and Gabby Bernstein—just C.Y.O.G. (choose your own guru, proud of that one), it was an entertaining way to pass five hours. On Wednesday, we departed our hotel (okay, highway-side motel) in Gallup, New Mexico and set out for Santa Fe. Our first stop? Modern General. Founded by Santa Fe mainstay Erin Wade, Modern General is, as you might expect, a modern general store. It is a store that has everything: gardening seeds, hand-thrown ceramic bowls by local artisans, local cheeses, and popular books. The piece de resistance of Modern General, though, is the full-service juice and smoothie bar. They sell all the juice and smoothie varieties you can imagine, plus a highly intriguing blend of coconut, pineapple, and basil—definitely trying my hand with incorporating Basil into a smoothie when I return. After a quick browse at MG, we headed over to Vinaigrette, the popular Santa Fe restaurant also owned and operated by Wade. For 2:00 pm on a Wednesday, the place was packed to the brim; we were seated at a corner table, one of the last in the house, which served as the perfect vantage point from which to enjoy an excellent hibiscus grapefruit lemonade and a chopped Greek salad. As an added bonus to the delicious fare, Wade focuses heavily on sustainability: seventy percent of the produce served at the restaurant comes from her farm, and all food waste is composted. Whether or not you make it all the way to Santa Fe, Wade’s principles are worth checking out. Following our Vinaigrette visit, we drove around town to observe the incredible architecture, and then set out for Amarillo, TX. We arrived just as the sun was setting, and made our way to Cadillac Ranch. Not only was this one of the most unique sites we visited, it was also the location at which my phone decided to die right as I attempted to capture a photo. If you ever find yourself on I-40 with creative energy in need of an outlet, bring a can of spray paint and get to work on the Cadillac’s—it’s not only allowed, but also encouraged. The story of Ant Farm, the collective behind the project is worth a read. Later that night, we were raring for some good old-fashioned Texas BBQ, so we headed to Robinson’s per a local’s recommendation. When we arrived, the woman essentially shut the door in our faces, proclaiming she had already locked it and “had no idea how [we] got through the damn door.” In the end, we settled for chicken nuggets and vanilla milkshakes at Chik-Fil-A. You win some, you lose some. Soundtrack: as we made our way towards Oklahoma on Wednesday and Thursday, we listened to Killers of the Flower Moon. Killers of the Flower Moon follows the Osage Indians, a tribe forced to relocate to a parcel of land in Oklahoma that happened to sit on some of the most valuable oil deposits in the country. In 1923, payments to the Osage from those who wished to access the deposit totaled $400 million in today’s currency. As the Osage net worth continued to rise, prominent members of the tribe began to go missing. Not only were we driving almost directly through the Osage territory, the story also seemed like an incredible, gripping murder mystery. However, Gann got so bogged down in the historical context and switched so frequently between present and past that you’d blink and miss an entire plotline. By Thursday, we were starting to get weary, and, though I had grand plans to visit “The Womb,” billed by Atlas Obscura as “a psychedelic arts center founded by the frontman of the Flaming Lips, I had to cast them aside as we decided we’d be better off driving straight to Memphis. If you’re a fan of the Flaming Lips, it is by all accounts worth checking out. Had we stayed overnight in Oklahoma City, we’d have headed straight to the 21C Museum-Hotel, a hotel boasting nearly 15,000 ft. of space for contemporary art exhibitions, and billed by Travel + Leisure as one of the Best New Hotels in the World [It List 2017]. 21c also contains Mary Eddy’s Kitchen + Lounge, a place I made a strong case for stopping at once I saw their mouthwatering photo gallery. Alas, traffic triumphed, and we continued to head east. We arrived in Memphis around 9:00 pm, and headed straight for Hog + Hominy in East Memphis, a “Southern-Italian” restaurant helmed by famed Tennessee chefs Andy Hudman and Michael Ticer. The cuisine is an effortless blend of Southern comfort food (beef & cheddar dog) with Italian flair (the incredible flatbread pizza). A highlight? The door to the kitchen also functions as a bookshelf, just in case you’re dining alone or your companion doesn’t suffice. One of the best meals we had on the trip. On Friday morning, I was in desperate need for anything that wasn’t a Nature Valley Almond Butter Biscuit. We headed to City Silo Table + Pantry, a funky health food store and café serving things so nutritious; I haven’t seen them on shelves in the East Village yet. After consuming the best green smoothie I’ve ever had (though I’m often guilty of it, this is not hyperbole) we headed towards our final stop: Lexington, Virginia. Twelve hours of driving later, we arrived in Lexington at midnight, where we happened upon a cute, colonial inn, where we were instantly turned away. “Good luck getting a reservation anywhere,” the night manager called after us. We laughed, wondering how and why Lexington, Virginia, could possibly be at full occupancy. The answer? The combination of a Virginia Military Institute reunion and a horse show. After weathering three more hotel rejections, we settled on what must’ve been the last available suite in town: a smoking room in the Best Western. Armed with an “odor-eating” scent spray bottle to combat the fumes, we set up in our final destination. I don’t think I breathed through my nose for two days, and my throat is still recovering, but nonetheless, Lexington is worth a trip. Soundtrack: Crimetown, a fascinating podcast about political corruption in Rhode Island. Great for fans of Serial & S-Town; I personally enjoyed it more than both of them. Our Saturday event at Washington & Lee was the whole reason we drove across the country. The event, held off-campus, was a success, so much so that a man of about 70 wandered towards the table we were selling at and purchased himself a blue seersucker shirt for his Virginia Military Institute reunion that evening. The verdict: PKOK: fit for all ages. As a post-event reward, we finally treated ourselves to some excellent Southern BBQ, courtesy of Foothill Momma’s BBQ & Juke Joint. The place was exactly as you’d expect an excellent, no-frills BBQ place to look: red-checkered tablecloths, plastic chairs, and menus on the napkin box. All of the meat is smoked in a smokehouse behind the restaurant, and the smokehouse nachos, which are served on potato instead of tortilla chips, were the best I’ve ever had. All in all, a satisfyingly Southern end to an epic cross-country road trip. Have you ever given/will you ever give a cross-country road trip a try? Let me know! Here are Daytripper’s highlights of an ideal day enjoying the Californian lifestyle at its best.